When you think of St. Paul, does the word "mercy" come to mind? This man, who received extraordinary mercy the day that Jesus appeared to him on the road to Damascus, in turn poured his life out in service to the Gospel -- the Good News of God's mercy. Paul lived the works of mercy. At least three corporal works of mercy are embodied in his life: He fed the hungry by raising money for the Church in Jerusalem, which was starving (Rom 15:25-26); he not only visited the sick, but did healings in the name of Jesus (and refused to take credit: Acts 14:8-16); and he spent much of his apostolate in prison, sharing a cell with a fugitive slave, Onesimus. In a touching letter to Philemon, Paul referred to -- befriending and evangelizing this runaway slave and petitioned the slave-owner on his behalf. Paul displayed an extra dimension of God's mercy when he suggested that Philemon take back Onesimus not as a slave, but as a brother (Philemon 8). Paul practiced of the spiritual works of mercy, too. He "counseled the doubtful" by regularly exhorting readers to put their faith in Christ. Think of his famous, "What can separate us from the love of God? "(Rom 8:35-39). Paul laid strong foundations for the faith in his 30 years of evangelization. Another spiritual work of mercy is "to instruct the ignorant." Wherever Paul went, he preached the Gospel, "in season and out of season" (2 Tim 4:2). He also bore witness to the faith among "the ignorant," those who had neither heard of the Gospel nor of Jesus. Many of our own acquaintances may be ignorant of the love of Christ and the liberating power of the Gospel. Paul asks us, "And how can they believe in him of whom they have not heard?" (Rom 10:14). "To admonish the sinner" is another work of mercy. Some bristle at St. Paul for reprimanding people for sins, but Paul embodies mercy when he points out human weakness. Did not Jesus, who died for our sins, overcome sin for all time? On Ash Wednesday, we heard, "Turn away from sin and be faithful to the Gospel." This Lent, let Paul's life and letters bring us to deeper conversion. During a long violent, storm at sea, Paul "comforted the afflicted," reassuring those on board that not one life would be lost (Acts 27). Throughout his letters, Paul offered words of solace to those who were suffering (Rom 8:31-32; 1 Cor 1:3-7; Phil 3:7-12). "Forgive offenses" and "bear patiently those who do ill" are works of mercy. In Philippians, Paul wrote from prison to friends. He reported that his enemies within the Church, out of envy, tried to make his imprisonment more difficult by proclaiming the Gospel. Apparently, their preaching "turned up the heat" on Paul. Rather than hold this against them, he said, "What difference does it make...whether in pretense or in truth, Christ is being proclaimed? And in that I rejoice!" (Phil 1:18). "Pray for the living and the dead," say the works of mercy. To his young companion, Timothy, Paul wrote: "I remember you constantly in my prayers, night and day" (2 Tim 1:3). Paul interceded for individuals and for communities; in turn, he urged his readers to offer up prayers for him and for the spread of the Gospel. St. Paul himself has the final word: "We have different gifts, according the grace given to each of us....If it is to show mercy, do it cheerfully" (Rom 12:6,8). I've seen Mr. Smith in action three times. Highly recommended. 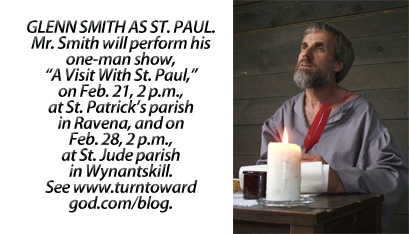 Try to make one of his performances in the Albany Diocese as an "add-on" activity during Lent. Pro-Lifers will especially appreciate the underlying message, that appeals to all Christians, "both in and out of season." This comment has been hidden due to low approval.